Governor Nathan Deal has vetoed the bill that would have placed a referendum on the ballot to clear of the disposition of the last remaining unincorporated area of Fulton County. The move has to come as a surprise to the newly elected official of the new city. The statement from the Governor's Office: "There has been continued debate between the City of Atlanta and the City of South Fulton as which city this district should belong, the cities and property owners involved, though, need to first come to an agreement to determine the future of the FCID. For the foregoing reasons, I hereby VETO HB 131 and HB 132." To our knowledge there has been no discussions with the CoSF or CoA on FIB because South Fulton just started operations. 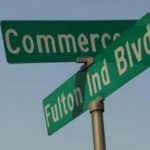 It's been stated on more than one occasion by landowners along the three-mile strip that they want to be a part of the City of South Fulton. It remains to be seen what happens next.